The Braves outscore the Seagulls 17-6 in the second half to secure their first state title in 98 years. 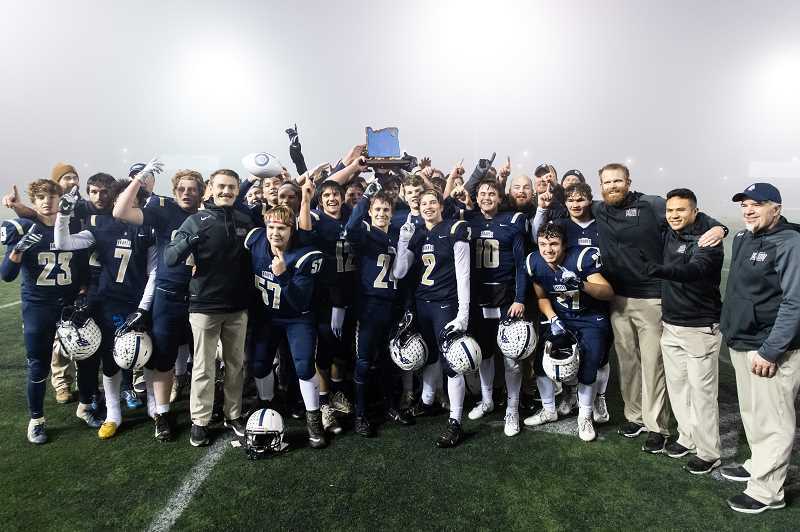 After 98 years, a bevy of near misses, and a handful of recent bitter defeats, the Banks Braves football team are state champions. 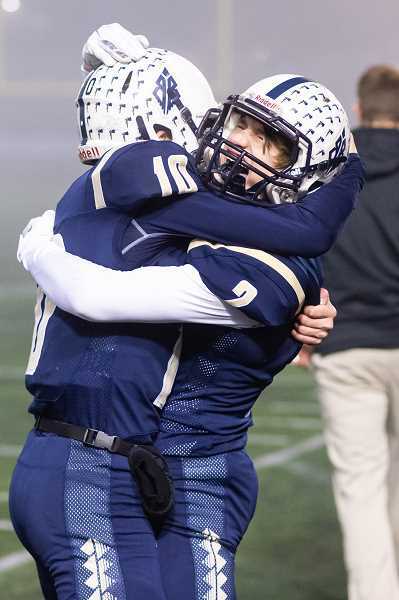 The Braves defeated league-rival Seaside 31-20, Saturday, Nov. 24, in the OSAA 4A state title game at Hillsboro Stadium, and in the process exorcised nearly a century worth of demons haunting a proud Banks program. "I feel amazing," said Banks tight end and defensive end Blake Gobel. "In 98 years this program hasn't won a state title and for us to come out and do it tonight, is just mind-blowing. I've dreamed of this day my whole life and we finally made it happen." Banks was led by Gobel, quarterback Hayden Vandehey, a second half defense that held the Seagulls standout running back Alex Teubner to just 29 yards — and Blake Markham. The senior standout receiver caught six balls for 86 yards, rushed for another 111, and tallied two touchdowns, none bigger than the one he scored to put the Braves ahead by 10 points with just 6:40 remaining. Leading by four after Seaside had just pulled within a score on a Teubner 5-yard touchdown run, Markham took a handoff, stretched the left corner, then hit the jets, tight-roping the sideline for 38 yards and what would ultimately be the game-clinching score. "He's just a special player," said Banks head coach Cole Linehan. "When you get him the ball, you just never know what's going to happen." Markham, ever the reluctant star, in the end seemed to understand the magnitude of the game, but also handled it in his usual calm, collective way, soaking-in the moment they all had worked so hard to achieve. "Just a lot of emotion," he said with a smile. "I'm relieved and satisfied to see our hard work pay off, and just feeling relaxed from the big win." Despite ending in the Braves favor, at halftime it was anybody's game. Banks struck first on a 58 yard pass play from Vandehey to Markham with 3:47 left in the first quarter. After a couple of pass plays moved the ball near midfield, Vandehey threw a quick pass along the line of scrimmage to Markham, who abruptly made a Seagulls defender miss, cut to the outside, then beat the remaining defenders to the end zone to give the Braves a 7-0 lead. Seaside however, after consecutive failed attempts, drove 76 yards in nine plays on their next possession, scoring on a Teubner 23 yard run to tie the game 7-7. Then, nearly seven minutes later, the Gulls took their first lead when Teubner capped another nine play drive with a 20 yard touchdown run, giving Seaside a 14-7 lead and seizing momentum for the first time in the game. But it wouldn't last. On the ensuing kickoff, Banks used a bit of trickery, running a reverse that saw Markham field the kick, but then handoff to junior defensive back Jarred Evans who went 87 yards untouched to tie the game 14-14 shortly before the half. "I told our staff that I had the best trick play ever; don't give it to Markham," Linehan said with a chuckle. "Every time we just feed him (Markham), but I thought that if we give it to Jarrod, he's an athlete too, so they rolled with it and I don't think they saw it coming. They were so focused on Markham." 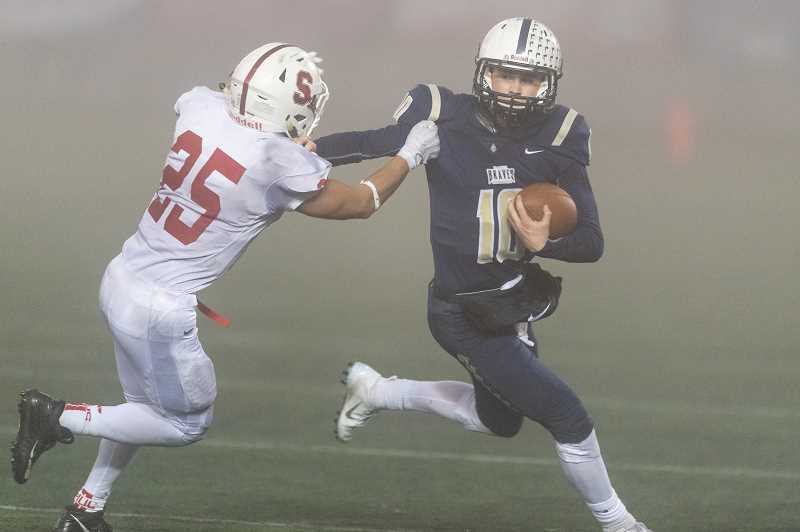 Banks' gain was Seaside's loss, and it was one of a number of mistakes — including five turnovers — that haunted the Seagulls on this night. "You can't turn the ball over and you can't give up a kickoff return," said Seaside head coach Jeff Roberts. "That's pretty basic football and they're too good of a team. We would've been able to weather that storm against a lot of people, but Banks is too good." Teubner, the Cowapa League Player of the Year, was also too good, rushing for 182 yards in the first half. The 6-foot, 180 pound back repeatedly sliced through the Braves defense and nearly appeared too much for Banks to handle as the teams headed for the halftime break. "We wanted to put pressure on them, but Teubner was doing a great job finding the cut-back lanes and getting to the second level beyond our blitzing linebackers," Linehan said. "So I told our guys that we're going to quit doing that and we're going to just keep him in front of us. I have so much faith in our backers and defensive backs, and they came through in the second half." Gobel understood, and was confident he and his brethren could do the job against Teubner over the remainder of the game. "We just had to play sound," he said. "We know how to beat them. Our linebackers need to flow and we need to fill gaps. We'd done it before, we just had to figure it out, and we did." The Braves retook the lead on the opening drive of the second half, scoring on a 29 yard pass from Vandehey to Gobel. After forcing a Seagulls three-and-out, Banks went 60 yards in 10 plays before settling for a Jacob Slifka 27 yard field goal to put the Braves ahead 24-14 with 15-seconds remaining in the third quarter. No one — especially the Banks faithful — expected it to be easy however, and Seaside held up their end of the bargain, going 59 yards on nine Teubner runs, the last a 5 yard smash up the middle to cut the lead to 24-20 following a missed extra point. Banks then, with 8:36 remaining and a state title hanging in the balance, drove 37 yards before Markham's 38 yard dash put them ahead by 11, and after Seaside's Payton Westerholm threw his third interception of the night, the Braves were a first down away from the title they so desperately sought. 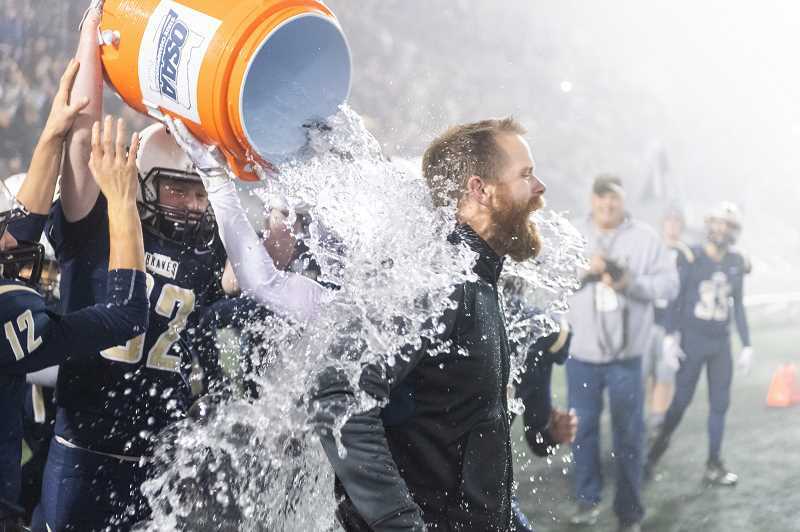 "When it was third and one, I told my offensive line that we're going to give the ball to Markham and if you block for a yard, you're going to be a state champion," Linehan said. "And when we got it, we knew it was ours." And it was, but it wasn't easy. After a heartbreaking loss to Ontario in last year's first round, this year's team was on a mission. "Last year after we lost to Ontario, coach took all the returning juniors and asked, 'What is going to be different and what is it going to take?' And we all committed," said Gobel. "And that's what it took." But it's been more than just a year for a lot of these kids, for a number of them — including Vandehey — remembered Banks' last state title game in 2008, in which they lost to another Cowapa League rival, Astoria. "I came to these games as a kid," said Vandehey. "I was at that game 10 years ago when we lost to Astoria and I told myself I wanted to be in that game and I want to bring it home. To finally bring one back for this community that's supported us for so long, is unreal." And Linehan, who's dad Ron coached 23 years before passing away in 2005, probably summed-up the win and the state title best. "I have great perspective of what this means," said Linehan. "I grew up with a dad who worked his tail off and he was the best coach I ever had. He never got one, but he was consumed by it every year to get there, and I saw that sacrifice and what it meant to him. It means a lot, but more than anything, I'm just really proud of these kids." Vandehey finished the night completing 15 of his 22 pass attempts for 194 yards, two touchdowns and one interception. Gobel had six catches for 93 yards and a score. Teubner finished with 211 yards on 31 carries and three scores.